Fall Protection Systems introduces a rope style fall protection system for use on covered hopper barges. 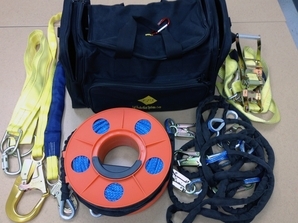 The rope system is easy to set up and use, and will accommodate up to 2 Users. The light weight system is contained in a shouldered duffel bag and weighs about 20 lbs. It can easily be transferred onto the barge and carried about without any difficulty. The Fall Protection Systems is easy to install system and takes just a few minutes to set up, and removal is just as easy. HARNESS AND LANYARDS NOT INCLUDED, SOLD SEPARATELY.